Okay, we know that’s not how it goes, but we couldn’t help ourselves, standing on this gorgeous pecan orchard. Now, as far as the food goes, Moe’s Original BBQ delivers a strike every time. The fire roasted BBQ is a process perfected and inspired by the handiwork of Moses Day, a legend in Tuscaloosa BBQ. With the meat, you will recognize a lot of the usual suspects, such as pulled pork, smoked sausage and fall-off-the-bone ribs. Russell, the General Manager, talked about how location matters with every Moe’s. That being said, each Moe’s is given plenty of room to be unique. Another way Moe’s restaurants are setting themselves apart from the competition is their Soul Sides. With classics like candied yams, collards and green beans, the sides are as important as the entree. And don’t expect any fillers. Russell was adamant about not adding fries to the menu. 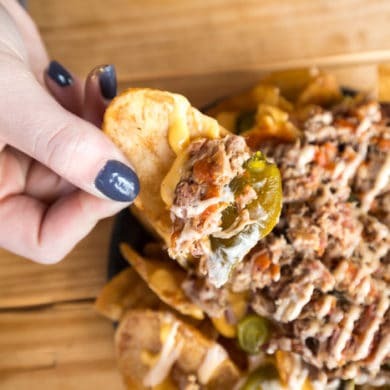 But if you are in the mood for some familiar game day flavors, try the Moe Nachos that come piled high with house-fried chips, smoked meat, BBQ sauce and much more. Freshness is also a priority at Moe’s. The Moe’s team is working with local farmers and even buying hydroponic lettuce from a local grower. Go see what’s cookin’ today at Moe’s. Moe’s is located at 20733 Miflin Rd, Foley, AL. For more information, visit the Moe’s website or call (251) 923-0079.